The comfort and quality of the walking shoe are what that appeals most to the buyer. The Rockport Men’s Pro Walking Shoe is packed with all those special features that men ideally want the best pair they have in their shoe rack. It is elegant, comfortable, and affordable and it promises to last for a long time. There are Rockport customers who have been using a Rockport pair for as long as a decade. ​They seem nice while walking and can be comfortably worn to field work as well. The immense variety further influences the buyer not to look elsewhere. Rockport manufacturer has the legacy to inspire fitness seekers with the ﻿﻿﻿be﻿﻿s﻿﻿t quality leather which gives your feet the much-needed support while on a long walk or taking part in some sport related activity. Let’s take a deep dive into some specific features and detailed information about the product which will help you in taking the right decision in quick time. ​Technology - The state of the art Strobel Technology lays the foundation of this shoe and plays a pivotal role in stretching the durability of the product. This is complemented with the EA cushioning to enhance support. Both of these makes the shoe durable, comfortable and well balanced and keep the wearer easy while walking. ​Material – The shoe is made from fine quality leather. A synthetic sole underneath provides a firm but comfortable base to the user. The material used in the shoe ensures a long lasting construction that would not tear away very soon. ​Style –The shoe is designed with a laced closure giving you the freedom to keep it as per your comfort and making it easy to put it on and off. ​Padded Support – The tongue and collar of the walking shoe is padded masterly to enhance comfort and an easy fit to cover up any extra space around your foot. This also helps in keeping the foot in place and avoid twisting while you walk. Miscellaneous – The Rockport provides with a removable insole that helps in the maintenance of the shoe. This is great if you need more cushioning or removes the sole when needed. Shoes are available in all adult sizes and by choosing them from categories such as D, G, M, W, and WW etc to perfectly match the size of your foot. ​• Durable and Flexible – The idea of the well-known Strobel Technology was pulled from the mattress industry and it is doing wonders in the shoe industry as well. It is the most optimum way of stitching leather and it enhances durability with the significantly improved flexibility of the footwear. • Premium Quality material – The shoe is made from premium quality leather which promises to last long with no wrinkles appearing over the top front part of the footwear. ​• Maintenance – The maintenance of the shoe is made easy with a removable insole which could be removed for drying the sweat after use. This also helps in keeping the shoe free from any unpleasant odor due to sweat. • Variety – You just name it and the shoe can be ordered in any color of your choices such as black, white, sports white, wheat, dress blue, and red. 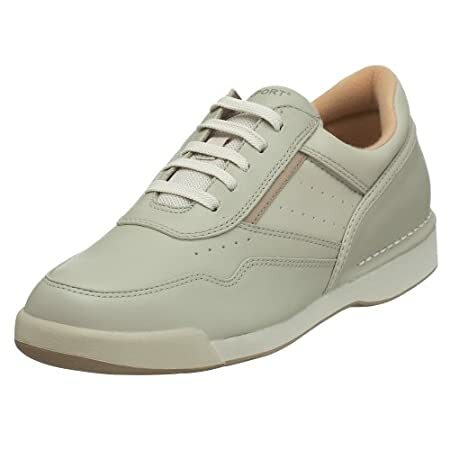 ​• Support – Walking shoes put the most stress on the tongue and collar of the shoes, especially when used for a long time. This issue is facilitated by adding ample padded support into the collar and tongue of the shoe which helps you to use it for long hours and without any fear of twisting your ankle. ​• Easy Return Policy – This pair purchased through Amazon offers 30 days free return policy with no hidden charges. • The arch support of the pair is not up to the mark and that for some men can be uncomfortable and slightly painful over a long walk or use. • The shoe at first seems a little tight to many users and takes some time to break in after some significant use. ​• The shoe lace holes are poorly stitched and show signs of wear and tear fairly quickly, especially when tightly laced. ​The customer reviews and scores about this casual footwear are rocking and that’s the reason that we put this product in our wish-list. It has an Amazon rating of 4.3/5 from hundreds of users who have used it so far. Apart from some negligible cons described above, the footwear overall is a sensational addition to the casual shoe industry. Customers prefer it for the reason that it meets their expectations and the efficient delivery and return policy of Amazon further gives them the peace of mind while investing in it. ​The textured leather gives the make and feel of pro footwear that every man desires to have. It is durable, classy, comfortable and flexible with the affordability factor that makes it worth having a go at. Once a Rockport customer will always be a Rockport customer and this theory is proving to be very true for this casual footwear for men from the manufacturer.